Say "NO!" to "Secure Communities" and anti-immigrant racism! Massachusetts Governor Deval Patrick recently announced his intention to sign onto "Secure Communities", a national anti-immigrant program falsely promoted as a crime-fighting initiative. Since October 2008, the misnamed program "Secure Communities", or "S-Comm" for short, has directly led to the deportation of hundreds of thousands of innocent immigrants, breaking apart countless families. The national program is a collaboration between local law enforcement departments and federal agencies like Immigration and Custom Enforcement (ICE). 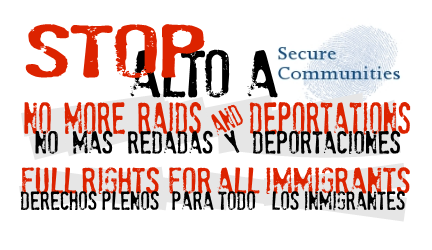 Sign the petition to oppose the "Secure Communities" anti-immigrant program! Nationally, 79 percent – about four out of five – of those deported through "S-comm" were defined by ICE as being "non-criminals." Those who have never committed a crime or only a low-level offense such as a traffic violation are the vast majority of those detained and deported through programs like this. In Suffolk County, 68 percent – two out of three – of those deported through "S-Comm" were considered "non-criminals" - ranking sixth highest in the country. Notably, in Maricopa County, home of racist Sheriff Joe Arpaio, 58 percent of those deported were "non-criminals". Currently, Suffolk County, which includes cities like Boston and Chelsea, is the only jurisdiction in Massachusetts participating in the program. The Boston Police Department has been participating on its own in a similar program since 2006. The same Black, Latino and Asian communities terrorized daily by local police through racial profiling, stop-and-frisks, and routine harassment, are the same communities where undocumented immigrants live an underground existence and are terrorized not only by police, but by their employers, landlords and the constant fear of discovery and deportation. Across the country, resistance to "Secure Communities" is rapidly growing, with several jurisdictions already opting-out of the program. Join the ANSWER Boston and many others in waging a campaign against "S-Comm"'s operation in Massachusetts and elsewhere. Only by winning full rights and decriminalizing undocumented workers will we ensure an end to the state-sponsored repression that is unleashed on immigrants for the "crime" of trying to earn a living.